You´d be surprised that a city like Tromsø, with its relatively small population size has a colourful relationship with games. Some point to the establishment of a satellite Playfish Studio here and being eventually bought over by Electronic Arts as the beginning of a new wave of creative expansion. Others mark the fact that Tromsø´s grassroot gaming community have already been running LAN events since 1998. Truth be told, the city has continually attracted gamers – but just as likely, would-be software engineers, electricians and AV geeks to meet-up annually and play together, compete or exchange ideas. Even despite the eventual closure of Playfish a few years later, the seeds of game development has already taken root. This led to a another wave of indie game studios to form up – enough to create a cluster of commercial activity around it – and a series of increasingly interesting game jams. In the last 10 years, the constant supply of games towards consumers increased by the hundredfold through cheap apps and Steam sales while broadband connectivity gives way to better on-demand options and livestreams of activity. Gaming enters the mainstream, whether you´ll like it or not, which makes the journey to working with games both easier and harder at the same time as products struggle to get sufficient attention. Which is why I´m glad to bring to attention several games in development in Tromsø, all of which have a very unique and refreshing take on the genre. Henriette Myrlund (one of the key co-founders of the aforementioned Splash Jam), had recently started Tellicherry Games and is hard at work to get her distinctively North Norwegian-inspired game, The Cabin, in full development after having already managed to raise some funding from NFI. 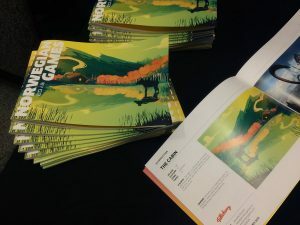 Best yet, the game is prominently featured on the cover of the this year´s catalog of Norwegian Games at the recent Game Developers Conference! 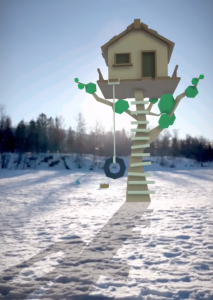 Stian Hanssen at Superplus is also working on a top-secret AR project (working title – Let´s Go Buildit) that is shaping up to be a delightful app to play where you collect resources and build digital structures over real world locations. And while we´re on the subject of games made in the north or about the North – there´s also Piramida by The Arctic – a first person survival horror loosely set in the abandoned mines of Svalbard. All of this products are distinctively centred around the locality of North Norway by design, which add a refreshing dimension to this region´s gaming history as it continues to mature collectively. With all things to do with technology – it is difficult to predict what is going to happen next. Even as we speak, new technologies such as VR and AR continue to make small subtle impact on how we may experience games in the future – perhaps not unlike the recent Ready Player One movie where players are fully immersed in virtual worlds (while reality unfortunately decays around them). As rapid as new technologies are introduced – there´s also the slow reality of how society embraces these changes, and market behaviours along with it. 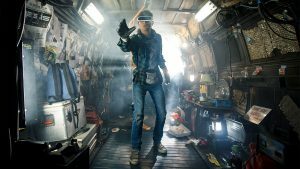 «Ready Player One» -could this be a forseeable future for VR development? These young cultural institutions such as game development and LAN events will have to continuously evolve to react with the changes, and produce an environment that is conducive enough for more talents to emerge. This quiet, unassuming corner of Norway has some great momentum going right now, and if there is enough support from the local community, there is bound to be a new breakthrough to come from this region. So whether you´re genuinely interested in developing games – or even just proud to call yourself a gamer living in Northern Norway – there´s plenty of ways to get involved. Get in touch with local developers and find out how you can contribute to their development, or else – simply meet up at the next LAN event, or organize meetups of your own. The point being is that this region got game – and it´s looking for ready players to make their marks on the leaderboards both locally and globally.